Edited by Tamar Tobi, 15 June 2016 - 09:32 AM. Its a little hard to figure out - it would help if you labeled the marker with size. 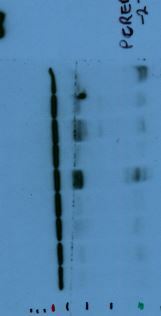 Note that phospho-protein bands are often smears or stepped/multiple bands (depending on resolution) as additional phosphates get added. I don't know if this is the case for CREB though. Your westerns look like they need some optimization - have you titrated the antibody to see what happens if you increase/decrease antibody concentration? details of what you have tried will help us to see what might be going wrong. You may be able to get (phosphylated)peptide to block binding of the antibody, which would indicate which is the specific band. thank you for your reply. I've attached the ladder I used for the membranes. As for your optimization suggestion - my lab is pretty tight on budget so I really ought to try and get the most possible out of these films. However, It might be helpful to understand the reasons for getting so many bands and whether this affects the validity of my results (assuming I am able to find the correct pcreb band). 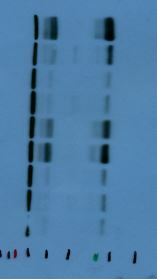 Also, Is it possible for a protein to show up higher in the blot than the specified molecular weight? Edited by bob1, 16 June 2016 - 12:02 PM. Yes, it is possible for proteins to run not at the predicted size - actually it is very common. I don't know if pCREB does this though. From a quick google image search it looks like it might run slightly higher than predicted, perhaps 45 kDa or a slight bit higher, so this might fit with the 48 kDa band you see. Forskolin treatment seems to enhance it, could you try that?